A Sunny Outlook for the First Day of School! One of the biggest changes any child experiences is the transition to school. While children are adaptable and adventurous, they are also fragile and innocent, and they need the guidance of parents, adult friends, older siblings, and family members to encourage them on the journey forward to life’s adventures. Starting school is a milestone where a positive outlook can make all the difference. Penelope is looking forward to her first day of school, and she wants to share that excitement with your child. Join Penelope as she prepares for her big day. About the Author Iris Benn lives in Wellington, Florida with her husband of forty-one years, Dr. Harvey Benn. She has three sons and seven grandchildren. 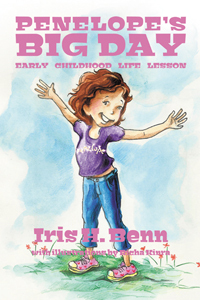 Memories of her sons’ first “big days” inspired her to write this life lesson book for future generations anticipating their first day of school. For some children, it is exciting; for others, the unfamiliarity can be scary. Iris still remembers the separation anxiety and unknowns of sending a child to school, and hopes that sharing Penelope’s Big Day can help your child get ready for their own big day. Iris is working on additional books about Penelope and her childhood adventures. Keep on the lookout for the next book in the series!